If your answer included that something is going on with the shoulder blades, then you would be correct. The technical name of this phenomenon is “scapular dyskinesia” OR “winging” of the shoulder blade. Many people go their entire lives with shoulders like this and without experiencing pain. Those who aren’t so lucky may end up with shoulder pain and impingement due to the alignment and posture of the shoulder blades. What this ultimately means is that one of the soft tissues is getting pinched in your shoulder joint. The most common structures to get pinched are the biceps tendon, supraspinatus, and bursa. People who have impingement typically have a hard time reaching their arm overhead, reaching across their body and touching their opposite shoulder, or reaching behind your back while getting dressed or showering. How do you know if your shoulder blades are winging? You can either raise your arms up overhead or lean forward with your hands on the wall in front of you (as in the picture). If your shoulder blades become more prominent or stick out, then you may have some form of winging. Now, if you’ve done the test, have determined that your shoulder blades are winging and have either pain, weakness, or have been injured, you can try the following exercises. I want you to keep in mind that any exercise or movement that you do when you are trying to heal your shoulder should be performed in a safe and pain-free way. Otherwise, you may end up making your pain worse. Find a sturdy counter top and rest your hands on top of it. 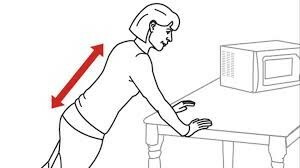 (If you have wrist pain, you can modify this by resting your forearms on the counter). With your elbows extended, gently push your shoulder blades forward by arching your upper back (this is not a push up). Hold this 3 seconds then go back to the starting position. Repeat 10-30 times and do 1-3 times daily. If you have difficulty with this, try scooting your feet a little closer to the counter and try again. I hope this brief article helps. If not, please give us call. We would love to point you in the right direction. If you want to learn more on how to strengthen your shoulder and get rid of pain come to my Complimentary Workshop on 7/5/2018 from 5:00 pm – 6:00 pm. You can RSVP here!